I am teaming up with 5 other fashion bloggers for a fun collaboration. Over the next 6 weeks, we will be showing you our takes on the latest trends. This week's topic is leather. Leather has been a Fall trend for several years now, and it is a no brainer that it is back this year. From leather panel leggings to a leather jacket, it seems that leather is popping up anywhere and everywhere this season. Add a leather accent of two, and you'll be chic and stylish this season. I chose a pair of leather leggings as my styling piece. I bought them from Express last year but they've been sitting in my closet unworn. When it comes to leggings, I have 2 general rules. Rule #1: They should be form-fitting but not skin-tight. Leggings tend to be less forgiving in general so pay close attention to your undergarments when wearing them out out in public. Rule # 2: Whatever top you're wearing should cover your behind. Leather leggings are very versatile. As you can see here, they can certainly be dressed up or dressed down for the occasion. Not to mention they are super comfortable and add instant chic to any outfit. I hope to inspire you to try this trend. 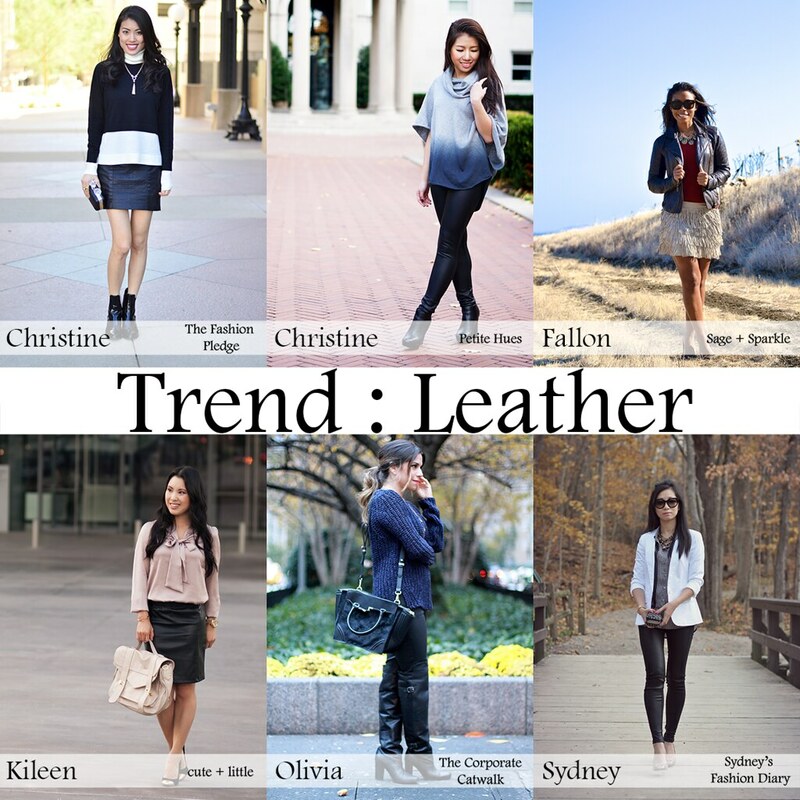 Don't forget to visit other bloggers to see how they style their leather pieces. Great outfit ideas Sydney. I wish people would be mindful when wearing something tight like leather leggings to cover their bottoms. Thanks for sharing! I LOVE your leather leggings. You look absolutely gorgeous! I love how you showed a day to night transition for your leather piece! Leather leggings are also a must-have in my book :) You and your pictures are so gorgeous - can't wait for the rest of our collab! Have a great day Sydney! Both of these outfits look great. You kept the leather leggings totally classy. How fun! 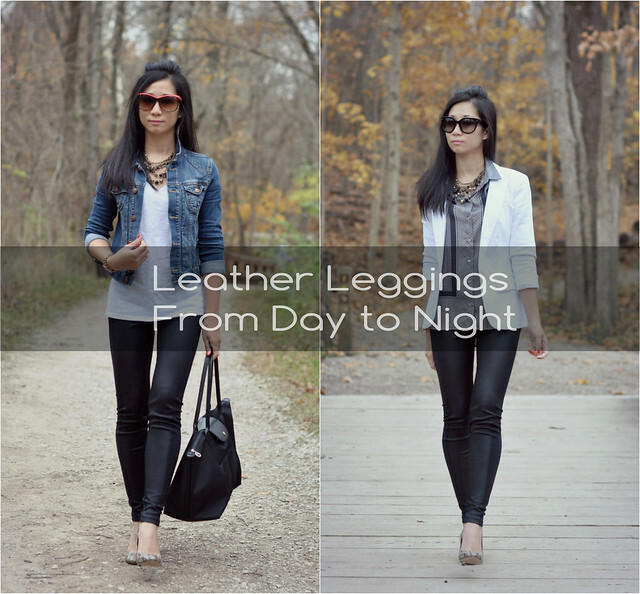 Leather leggings are a true classic--I'm still wearing the ones I bought last year! Sydney - I love the day to night look and I agree, leather leggings are a must as they are so versatile! Looking forward to the next 5 weeks! Sydney, you are rocking this leggings and you look great in them. What a great collaboration with fellow petites. I LOVE this post! You look incredible in leather leggings! wow, what a great look with leather leggings! i love how you transitioned it from day to night. Good tip to cover up the bum! Definitely classy ways to wear them! I love both looks, especially the HM top in the date night outfit!